Yamaichi Electronics has launched a new 0.5 mm pitch high-speed transmission FPC connector for several markets such as industry, automotive, and data networking. The main features include the ability to transmit up to 20 Gbps, the very compact design and the direct locking feature for the FPC. The first advantage is the high-speed ability. 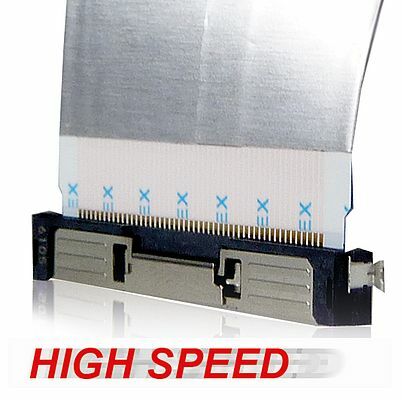 Using Yamaichi Electronics´ original FPC called YFLEX® the system is able to transmit up to 20 Gbps. With standard FPCs the connector can transmit only up to 10 Gbps. Depending on customer requirements, the internal connection can be provided as a whole package consisting of cable and connector. Impedance is matched to 100ohm. Therefore, it offers an added advantage for use in high frequency environments such as LVDS, TMDS, V-by-One HS or FDP Link. Once the current maximum speed is achieved, this connector can send signals according to the IEE 802.3bj specification for 28 Gbps per channel required in the data networking market. Yamaichi Electronics is now investigating for methods to achieve 56 Gbps standardized with CEI-56GVSR&MR for the next generation. Secondly, this connector is one of the smallest designs in the market and saves space for other layouts on the PCB. It is available with 30, 40, and 50 pins. Even the version with a maximum pin count of 50 has a length of only 33.5 mm. The width is only 4.9 mm. The contact pitch is 0.5 mm. Third, the system is very easy to assemble. There is no need to attach an adapter to the cable side. Thus, the cable can be plugged directly into the connector. Once the connector is unplugged, the operator only needs to push a metal part located in the middle of the connector to pull out the cable. The HF513 connector is suitable for internal connections which require high-speed data transmission in a very dense area. Moreover, with its easy operation mechanism it saves handling time in the production process.